Avoiding the cliche of flowers, chocolates and champagne this Valentine's Day could be your most romantic date so far! Walking with ViewRanger might be the perfect solution to your "what shall we do?! " Valentine's Day despair. ViewRanger is a mobile GPS mapping app, which allows you to download your own or other peopleâs walks to your smartphone and then follow them using the phoneâs GPS. Why not pack a picnic and a rug and head into the great outdoors with ViewRanger and your loved one this year, for some old-fashioned quality time and romance. We have suggested a variety of walks below to kick-start your romantic walking plans, but if you know any better please let us know! If the prospect of a walk seem a little mainstream for you, and you want something on the wild side perhaps you should consider wild swimming. 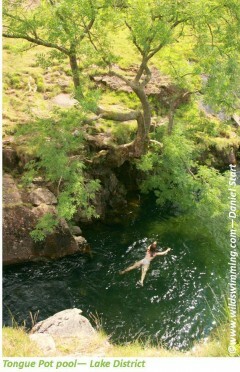 A craze for the outgoing and adventurous, wild swimming allows you to explore otherwise inaccessible sights and scenery. What could be more romantic that exploring a hidden waterfall, or resting on a concealed cove with a picnic? The Tongue Pot, Eskdale walk is a short 2 mile route along the River Esk, in the west of the Lake District. Along the walk there are some spectacular plunge pools and waterfalls, tried, tested and uploaded to ViewRanger by the writers of the Wild Swimming book. Click here to see more information about the Tongue Pot, Eskdale walk. Long ago, people would flock to the post office in Lover to send their Valentine's Day cards and obtain a "Lover" postmark. Sadly the post office has now closed, but the village of Lover does still offer the perfect setting for a romantic walk, with an element of "cheese". Lover is located on the northern edge of the New Forest National Park and is perfect for a romantic walk in the woods with your loved one. The first part of this walk is lined with rhododendrons, which look spectacular when flowering. This route also passes by two pubs and a restaurant â ideal for a quick rest, or a bite to eat. The walk is a circular 9 mile route, uploaded by Walkingworld.com. For more information on the route click here. Conwy Mountain is found just off the north coast of Wales, and this walk has some spectacular views across the Irish Sea, as well as the Snowdonia mountain range to the south. 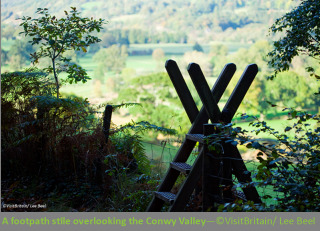 This walk is also littered with kissing gates, which would make a humorous talking point on any romantic walk! The walk around Conwy Mountain is 7.5 miles long. It has been uploaded by Walkingworld.com and is freely available to download to your smartphone via ViewRanger. Click here for further information about the route. This walk takes in the fantastic sights at Stourhead estate â the location for some of the scenes in the recent film adaptation of Pride and Prejudice. In particular this walk passes nearby the awe-inspiring Temple of Apollo, where Mr Darcy famously declares his love for Elizabeth in the new film. This is the perfect place to escape from modern life, into Stourheadâs beautiful 18th century gardens. The walk around the estate has been uploaded by Webtogs and is only 3 miles long, allowing you to soak up the atmosphere as you go. The route is free to download from ViewRanger, and further information can be found here. However you decide to spend you Valentine's Day this year, remember the outdoors has a great deal to offer, including originality and enjoyment! If you use ViewRanger on your special day post your pictures on our Facebook site, or tweet them to us - we love hearing from you!